In this Woodland Watch, I give a brief overview of the basic Terrasylvan Lore as I understand it. There has been a lot of talk lately about Terrasylvan Lore and references to supernatural entities, events, and people. To someone who has been in the group long enough, these references are relatively understood, but to a newcomer our lore can be confusing. That’s why in this Woodland Watch, the goal is to give a brief overview for those who are unfamiliar with Terrasylvan Lore and to request for further insight from those who are more familiar. In general, Terrasylvan Lore is our Mythos or the shared imagined world within the group. Our personas are versions of ourselves within that world and we tell the stories of that world as Lore. Anything that adds to that shared world-building experience is considered lore. There are characters, places, and history like in any book. We all just share the role of author. The World at Large is in medieval England, but within an Arthurian setting. An Arthurian setting means that it’s a slightly more fantasized version of the Middle Ages without becoming High Fantasy. Yes, there is magic, castles, and dragons but we’re still in the “real world” as normal human beings. Within the World, we have the Woodland Realm known as Terrasylvae. Terrasylvae was founded as a sanctuary for misfits, vagabonds, and outcasts. Think of it as our own version of Robin Hood and the residents of Sherwood Forest. Set away from the hustle and bustle of medieval city life, we call the Woodland Realm our home and declare it as a free land for any who seek it out. We live together within our forest village and defend it and Woodland with our lives. As more and more people have flocked to Terrasylvae, groups have formed to defend it. Currently, we have three groups charged with defending the Woodland Realm: the Order of the Rose, the Rangers, and Iron Thorn. The Order of the Rose was established as the defenders of the Village itself and the people within. The Order of the Rose trains in the art of the rapier and assists those in need. People may call upon the Order of the Rose for aid and members of the Order will be sent on Missions to accomplish the tasks before returning. Where the people are, the Order is there to defend. The Rangers oversee and look over the land of Terrasylvae and protects our borders. Through their vigilance, the Rangers defend where the Order of the Rose cannot and are typically the first responders to any problem that fall within our realm. Additionally, the Rangers travel and scout additional areas, seeking out whatever may benefit Terrasylvae. Iron Thorn train and fight as the knights of old. They are the military arm of the Terrasylvae and in times of war, their heavy fighting skills lead the way into battle. It is not often that Terrasylvae has gone to outright war, but we believe in being prepared. Within Terrasylvae we have several locations that are referenced a lot. These locations are not the only places within Woodland, but simply the most common. The Village itself is the central hub of the denizens of Terrasylvae. It isn’t a large village, but it’s enough. We believe in living within the forest and most building are made with wood and stone. As more and more people come to dwell in the Village, they create a melting pot of culture and services that benefit the people has a whole. The Heart of Woodland is a sacred place within the forest. It is the oldest tree and is secluded away from the rest of the world. We protect the Heart of Woodland and keep its location secret from all those who may wish to do harm to it. Many ceremonies and other important events are done in the presence of the Heart of Woodland to signify its importance and recognize the forest’s protection to all those who seek shelter. Woodland is an ancient forest and near its center are the ruins of an equally ancient castle. The Castle is used as a significant landmark and outpost for those traveling through the woods. Over the centuries, the Woodland Realm has grown to be quite expansive. Stretching across the land, the sheer size and depth of the forest is one of the main reasons Terrasylvae remains safe and hidden from the rest of the world. Upper Woodland is recognized by resting at the base of the mountains and its hilly terrain. Middle Woodland is the core area of the forest and the thickest areas of trees are there. Lower Woodland’s tree cover thins, but makes way for rivers and fields. Within Woodland is Fairy Glen, the home of the fairies and the fairy queen, Titania. Titania and her fairy folk guard their sanctum and the forest jealously and all those who journey to the Fairy Glen, should show respect and bring offerings of flowers and other beautiful things, or else risk the wrath and spite of Titania. Hidden in a rocky face in Upper Woodland is Haute’s Den. It is a deep, dark cave where Woodland’s resident demon lives. The area around his den can feel dark and is advisable to avoid while traveling. Those who do risk to enter Haute’s Den may be able to make a deal with Haute himself, but his deals always come with a price. Along with the locations, we have several entities or denizens that live within Terrasylvae and share their home with us. These are the most commonly referenced, but may be fairly new additions to Terrasylvan Lore. Dwelling within Fairy Glen, Titania is a lover of beauty and nature, but a jealous type like all the Fae. Those who have her favor garner a special place in their hearts for the flowers and roses of Woodland. Titania and Haute are typically at odds with one another and fight over what areas of Woodland they can claim dominion. Haute is a nefarious demon that preys upon unwary travels and beautiful young maidens. Luckily, he has grown slightly fond of Terrasylvans and tempers his nefarious schemes against us. He occasionally is willing to make deals for those who are desperate, but in return demands a price of his choosing, usually as some sort of sick joke to remind them that they are making a deal with a demon. Sylvanus is the resident wyvern of Woodland and overarching protector of the Woodland Realm. It is only just recently that we discovered his name to be Sylvanus, though he has many. Sylvanus is a shy and reclusive being, rarely showing himself to any human. A Master in each craft, like the Master Swordsmen, take upon themselves the title, “Wyvern of Woodland”, in emulation of Sylvanus and his undying duty to protect the Woodland Realm. Perran is Terrasylvae’s resident trickster. He causes trouble and mischief wherever he goes and is blamed for any light-hearted misfortunate that befalls a Terrasylvan, even when it wasn’t his fault. Water is the life blood of the forest and the waterways of Woodland are protected by Vann Oru. Vann Oru is a spirit that takes the form of a great wolf and traverses the forest through the rivers, streams, and lakes. Dyn Hysbys is a wise old man that almost just appeared in the Village one day and has never left. The populace as a whole has come to the conclusion that he is a wise old man who may be magical and has a knack for appearing and disappearing in quite sudden and unusual ways. He seems to know everything that is going on in Woodland, oddly enough. Inhabiting one of the large cottonwood trees in Lower Woodland, Maeton is a dryad who helps encourage the growth and natural spread of Woodland’s foliage. Petal is a strange name, to say the least, for a bridge troll who dwells beneath the bridges found within Terrasylvae. Additionally, last I heard, Petal has quite the feelings for our own Rhiannon. I sure would like to hear that love story! If you thought Perran the Spriggan caused enough mischief, just wait until you come across Dobble & Puckleflup. You better hope that you’re never their target for whatever trouble they’ll think up next. It’s all in good fun…for them of course. Additional characters come and go as we tell stories within the group, which means this list may change frequently. Blackkoven is our current arch-nemesis. He is the local lord of the area surrounding the Woodland Realm and he feels that he has claim over it. For that reason, he believes that we are trespassers and pests upon his land and has made it his goal to eradicate Terrasylvae from “his” woods. He has a fortress outside the forest and has a lot of resources. He is well liked in the English nobility and has earned his fortune through assisting in the colonization efforts. 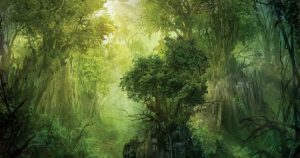 Remember, this list is just a general overview of the most commonly referenced elements of Terrasylvan lore. Each piece has additional history and room to be added upon. That’s why we share the role of author and together we can build the world of Terrasylvae with each new piece of story, art, music, or idea that you create. If you have additions or comments about this general overview, please leave a comment below and help us all come to a better understanding of Terrasylvan Lore. Do you have a question about Terrasylvan Lore? Is there something you'd like to add or clarify? Skill is the least important of the Four Levels of Importance, but it is still important. We should always strive to improve our skill. Inside Terrasylvae and outside of it. Within the group, we have the option of choosing the name we will be known by. Overtime, it becomes a part of who we are. Why did you choose your fencing name and what does it mean to you? The Winter Warrior Challenge is your opportunity to keep the rust off during the Off-Season. Each Month will have a different theme and there will be different activities you can do each week.